Click on the blue numbered circles for more information about a section of your bill. 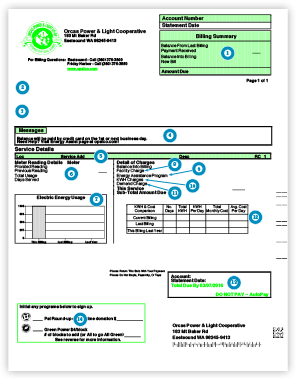 Simply scroll down to view and learn more about the front or back of the sample bill. Info on payments received and amounts due. Please call 360-376-3500 to update your contact info for billing and for capital credits or go to SmartHub to update. Credit or debit adjustments to your account such as voluntary donations to PAL, disconnect fees or other service charges, annual meeting bill credit. Key info and updates from your Co-op. Actual meter reads by date. If estimated, will be labeled ‘Estimated Reading’. Usage = this month’s reading – last month’s reading. Quick look comparison of your energy usage. Go to SmartHub for more detail. Co-op wide charge, based on kWh usage, to fund Energy Assist. The actual kilowatt hours usage and the rate you pay for energy. More info on rates and charges. Placeholder for future when BPA demand charges for residential rates are passed through. 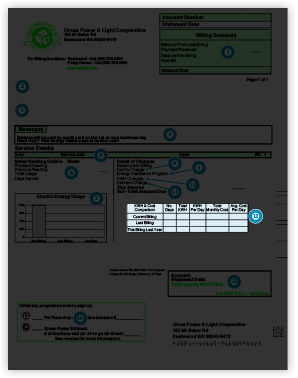 Your energy usage comparison in more detail. Go deeper with SmartHub. Payment options and Co-op info. Learn more in our Resource Library.